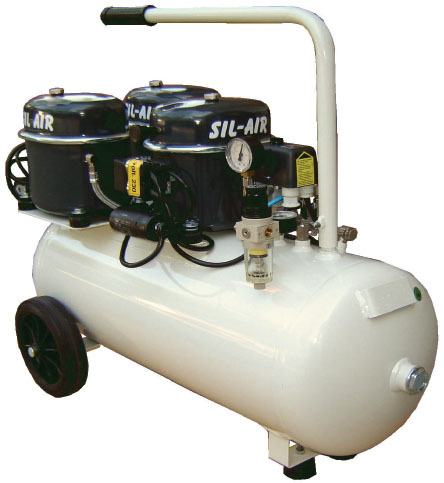 Dimensions: 33.8" x 15.7" x 29.5"
The Sil-Air 150-50 is an air compressor from the global manufacturer that is engaged in producing HVAC equipment for almost half a century. This company has earned the trust of customers in more than 150 countries worldwide. And that's no accident, as a large team of venturesome, skilled and technical workers is employed in the creation of these powerful and efficient air compressors which are known for their quiet operation. These and many other features of Silentaire compressors like reduced energy usage, simplicity, and comfort in use are what many customers appreciate them for. Besides, Silentaire Technology offers a wide range of different engineering solutions that are capable of coping with all customers' diversified needs. The Sil-Air 150-50 Compressor refers to the Sil-Air line of Silentaire compressors. And that means it is one of the quietest and, above that, totally automatic units by Silentaire Technology. We know that for you personally, a noiseless compressor running can be critical. This facilitates placing of the compressor itself and also just makes the airbrushing process more enjoyable. In addition to that, Sil-Air compressors provide completely automatic operation due to the special pressure switch. With it, you won't have to keep an eye on the level of air pressure all the time as the switch will do everything for you. As soon as the air pressure reaches its maximum level, the pressure switch stops the motor. Then, it will start the motor again after the pressure drops to its minimum. a carrying handle or wheels allowing for extra portability. This Sil-Air 150-50 has 3 heavy-duty pumps, 1/2 HP each that make the air compressor even more powerful, durable, and reliable. Along with the compressor, the packing also contains an oil bottle type ROLOIL - SINCOM/32E, instruction manual, and a tank certificate. During 12 months from the date of purchase, you can get defective parts of the compressor freely repaired or replaced by the manufacturer. However, the electric parts and worn compressor parts are not under this guarantee. In case, the authorized personnel finds evidence of tampering or bad usage, the guarantee will automatically cease. In this connection, we urge you not to try to repair the compressor by yourself.